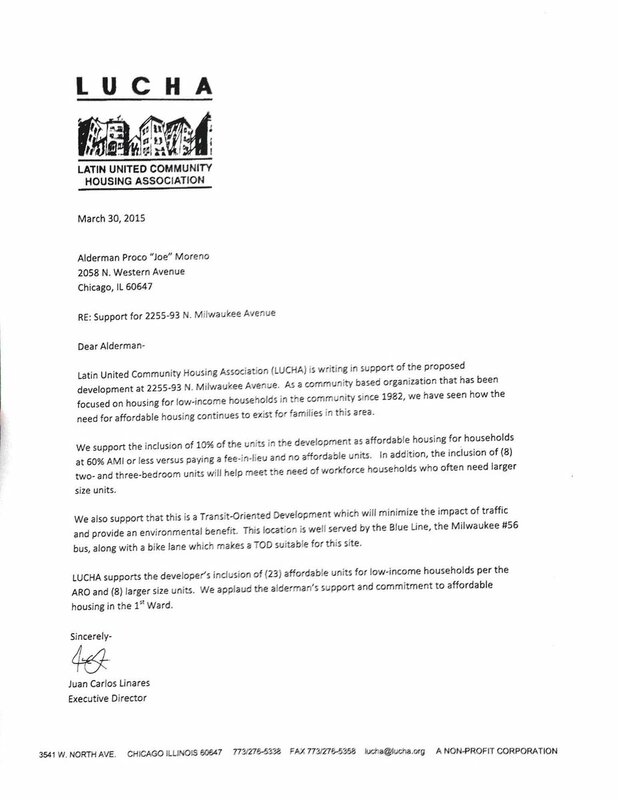 In an encouraging sign, the Latin United Community Housing Association, or LUCHA, has signed a letter in support of a 200+ unit apartment development on Milwaukee and California in Logan Square. As I’ve written before, these kind of projects are the best hope we have for mitigating displacement in quickly-gentrifying neighborhoods: not only do they provide room to accommodate new arrivals, but they’re the only means of triggering the city’s inclusionary zoning law, and directly creating subsidized units. (In this case, the developer has gone beyond the standard 10% floor to include 21 affordable units and eight “workforce” units that will be priced between the market and affordable rates.) Still, neighborhood groups have been understandably nervous in the past, given the association of new construction with gentrification. Hopefully, LUCHA’s support here will be a sign for other housing groups that, when done right, new development is a tool for more, rather than less, housing diversity. Notably, the Greater Goethe Neighborhood Association – representing a different local constituency – has also endorsed the proposal. It would be nice to think that this is something like the beginning of a new development paradigm, at least on the Northwest Side, in which affordable housing groups and neighborhood associations that have traditionally played an anti-development role advocate for high-density, inclusionary projects near transit. I still haven’t seen revised renderings for this. Apparently three stories have been chopped off the taller (north) tower block, and the blank wall along Milwaukee between the towers has been revised with a bigger retail component. I’m agnostic about the height change, but that blank wall was just going to be awful, so I like that change. 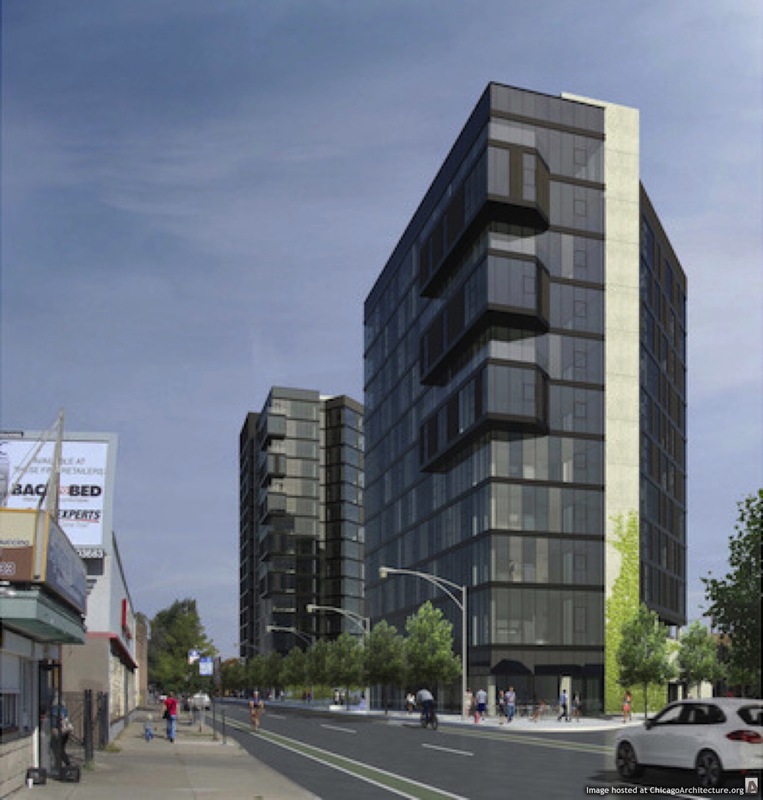 Also worth noting that two other TODs have already been entitled along this stretch of Milwaukee, with 40 and 120 units, their approval flying under the radar due to Buono’s twin towers.